“Over the last 50 years the land has transitioned from natural habitat to primarily urban development, negatively impacting the water that ultimately reaches Old Tampa Bay.”1 [See Figure A: Map of Old Tampa Bay Segments] Wetlands, mangroves, and open porous land that have historically provided Pinellas County’s waterways with natural filtration have declined rapidly. Surfaces that are impervious to rain and stormwater infiltration (or absorption) now blanket green areas and begin to contribute to “source points” of waterway pollution. 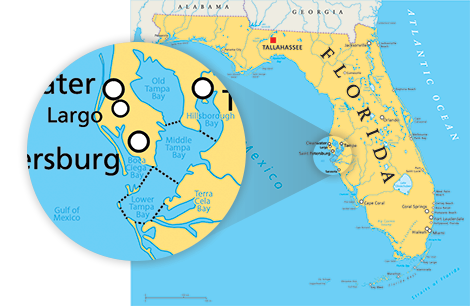 The Southwest Florida Water Management District (SWFWMD) is “actively involved in maintaining and improving the water quality within its boundaries.”4 The SWFWMD plays a massive managerial role in approving the implementation of stormwater treatment systems to mitigate point source pollution as part of the program now in place in Pinellas county. 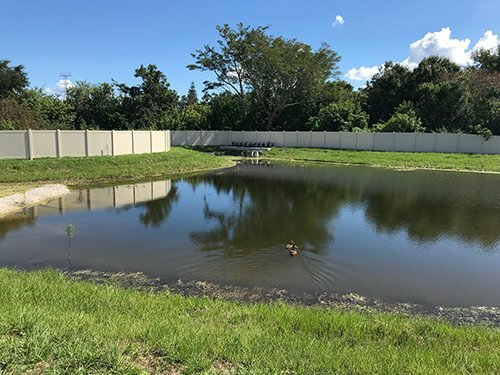 Some of these systems include proven BMPs and efficient stormwater systems that have successfully saved thousands of watersheds throughout the country and are now being deployed in Florida’s coastal communities. One notable development in this expanding part of Florida is the Orange Blossom Townhome project in Largo. Set to install 55,601 cu. 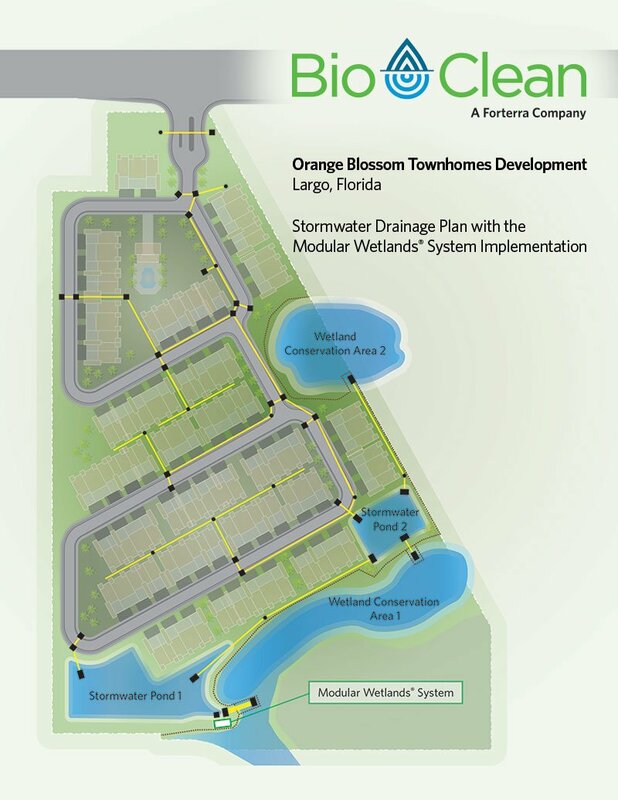 ft. of impervious surface, the site’s design involved drainage systems that would divert sheet flows collecting hazardous nitrogen and phosphorus pollutants away from two wetland conservation areas and toward two manmade stormwater ponds [See Figure B: Orange Blossom Development, Drainage Plan]. Water from these ponds would eventually flow into the downstream “Wetland Conservation Area 1” or retention pond, but not before a reliable and effective pretreatment BMP treated the polluted water. The SWFWMD required the site’s pretreatment device to remove 76% nitrogen and 67% phosphorus prior to discharging into a wetland conservation pond and required a draindown time of 36 hours (before 36 hours, the stormwater system must have no remaining standing water). 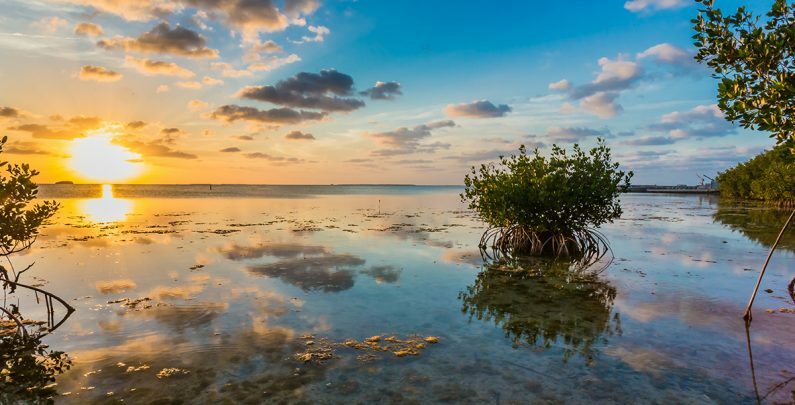 Bio Clean understands the loss of this natural resource and has spent years returning this valuable part of nature’s cleaning system back to the environment – and now Florida’s coastal communities – through an innovative and cost-effective technology called the Modular Wetlands® System. The Modular Wetlands® System is a biofiltration system that utilizes horizontal flow to accomplish a number of unique superior conveniences that benefit the environment and land owners (or developers) looking for cost-effective advantages. Florida’s Old Tampa Bay will see long-term benefits from the system’s proven ability to remove 76% of the nitrogen and 67% of the phosphorus present in this residential development’s stormwater runoff. Modular Wetlands® holds a number of unique beneficial advantages that are crucial to Florida’s fight against high coastal nutrient levels. The system has multiple stages of treatment that give it superior capacities and maintenance efficiencies. When it comes time to clean the system out, trapped pollutants have been compartmentalized in an easy-to-access pretreatment chamber which are cleaned with a typical vacuum truck. The horizontal flow design allows the system to efficiently provide the same treatment as other systems with an even smaller footprint. So, while land owners and managers enjoy long-term low maintenance costs, developers benefit from low excavation and construction costs. Additionally, during extreme rain events, water volumes can increase abnormally, causing some other systems (typical downward flow systems) to fail as they get overwhelmed. As they fail, they release pollutants they’ve already collected into downstream rivers, tributaries, and the bay. In the Modular Wetlands® System this hazard is avoidable. Horizontal flow allows for internal high-flow bypass (Modular Wetlands® Side-by-Side Orientation design), placing the pretreatment and discharge chambers adjacent to one another [As seen in Figure C: Side-by-Side Orientation]. This design allows high flows to bypass the main biofiltration chamber internally, keeping previously collected pollutants trapped – a powerful pollution safeguard in heavy rain-states like Florida and the rest of the southeast. 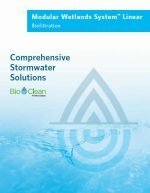 Wetlands will always be a vital part of Florida’s stormwater treatment, and Bio Clean’s Modular Wetlands® System will continue to contribute and provide communities with a confident solution to continually protect Florida’s shorelines, environmental health, and beauty. The Modular Wetlands System Linear is the most efficient and versatile biofiltration system on the market, and the only stormwater biofilter using horizontal flow which improves performance, reduces footprint, and minimizes maintenance. Washington State DOE TAPE GULD Approval Without Plants: With or without plants (open planter or sealed), the system maintains superior performance in any design configuration. Can Accept Existing Pipe Below Surface: Piping into the system opens up numerous configuration and design options, like downstream use or diverting for retrofits. Works Months Without Requiring Maintenance: The easily accessible pretreatment chamber traps and isolates trash, sediments, and hydrocarbons. A unique feature, proven to keep maintenance frequencies & costs at industry-leading lows. Can Accommodate High Flow Internal Bypass: The Side-By-Side Orientation option allows abnormal high flows to bypass from pretreatment directly to the discharge chamber. Design Flexibility & Safety: Space-saving design provides low excavation and installation costs, plus there is no dangerous depressed planter bed.